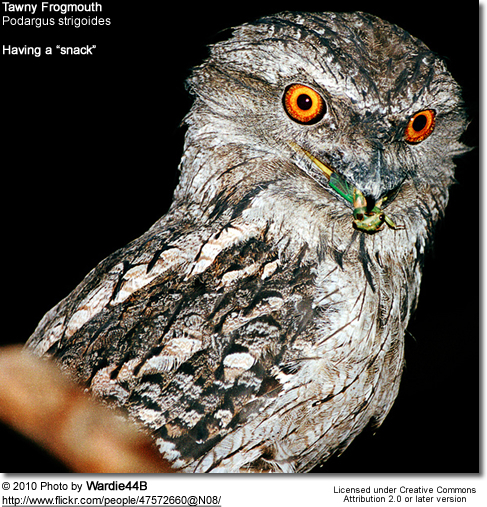 The frogmouths are a group of nocturnal birds related to the nightjars. They are found from India across southern Asia to Australia. The three Podargus species are large frogmouths restricted to Australia and New Guinea, and have massive flat broad bills. In April 2007, a new species of frogmouth was described from the Solomon Islands and placed in a newly established genus, Rigidipenna. They are named for their large flattened hooked bills and huge frog-like gape, which they use to take insects. Their flight is weak. They rest horizontally on branches during the day, camouflaged by their cryptic plumage. They are known to take larger prey such as small vertebrates (frogs, mice, etc. ), which are sometimes beaten against a stone before swallowing. The ten Batrachostomus frogmouths are found in tropical Asia. They have smaller, more rounded bills and are predominantly insectivorous. Both Podargus and Batrachostomus have bristles around the base of the bill, and Batrachostomus has other, longer bristles which may exist to protect the eyes from insect prey. Up to three white eggs are laid in the fork of a branch, and are incubated by the female at night and the male in the day. Recent research suggests that the two frogmouth groups may not be as closely related as previously thought, and that the Asian species may be separable as a new family, the Batrachostomidae. Usually placed in the order Caprimulgiformes, another recent study has cast doubt on the frogmouths' placement within that order, and they may be distinct enough to warrant an order of their own, Podargiformes, as Gregory Mathews proposed in 1918.